"At 8 A.M. on October 23, 1864, Federal Cavalry under General Alfred E. Pleasonton forced a crossing of the Blue River at Byram's Ford and attacked the stone ridge, which was defended by Confederate troops under General John S. Marmaduke. After three hours heavy fighting and severe casualties, the hill was taken. This defeat of Marmaduke's Division enabled Pleasonton to outflank General Sterling Price's Confederate Army, and contributed to General Samuel R. Curtis' Union victory at the Battle of Westport." Directions to Stop #16: Continue heading east on Meyer Boulevard for about 0.75 miles to Swope Parkway. Turn left (north) for about 0.3 miles and then turn right (east) onto 63rd Street. Continue heading east on 63rd Street for 0.75 miles and turn left (north) onto Manchester Trafficway. The marker is about one tenth of a mile ahead on your right. This tour stop is located in Kansas City, Missouri 64132. Description: Immediately to the north of this marker is the 15-20 foot rocky ledge on which the Confederate defenders were waiting for the attack from Major General Alfred Pleasonton's Cavalry Division. On the wooded ridge just west of where you are standing was the main defensive line for the Marmaduke's Confederate Division. 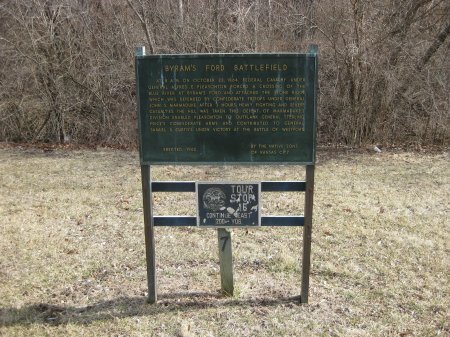 The Federal First Cavalry Brigade commanded by Colonel John F. Philips was deployed to the left of Byram's Ford Road along the Big Blue River to your left. The Fourth Cavalry Brigade commanded by Colonel Edward F. Winslow was dismounted in the open field to your right in front of the rocky ledge.